Red meat is the dark-colored meat of adult mammals like cow, sheep, and even some fowl. It is rich in protein and iron, but also contains high percentage of saturated fat and thus contributes in causing obesity. Plus, scientific studies indicate that daily consumption of red meat tends to increase the chances of developing cardiovascular diseases, strokes, type-2 diabetes, arthritis, hypertension, and certain types of cancers such as colorectal, pancreatic, endometrial, lung, stomach, bladder, and breast cancer. Consumption of beef, in particular, raises the risk of ischemic heart disease. So, people are encouraged to look for other alternatives. Moreover, vegetarians or those who are trying to adopt a meat-free diet, too, strive to include red meat substitutes in their diet. Hence, you can use commercial red meat substitutes containing a mix of soy, vegetables, gluten, and flavorings. Unlike red meat, they are low in cholesterol and saturated fats yet, have a taste similar to that of meat. Tofu, also called been curd, is derived by coagulating soy milk. It is low in calories and fats but high protein, isoflavones, B vitamins, iron, calcium, zinc, and selenium. In fact, half a cup serving of raw tofu contains almost 10 g of complete protein. Plus, it is rich in manganese, which metabolizes carbohydrates and strengthens the bones. Tofu can be used as a good meat substitute because it can be grilled, baked, and sautéed. Moreover, it can be taken with soups. This is another soybean-based product. It is prepared from cooked and fermented soybeans and has a nutty flavor. Besides, it has a much firmer and meaty texture than tofu. Needless to say, being made from the entire soybean, not just soy milk, it is good for health. This is another healthy substitute for red meat. Beans are low in calories, but high nutrients like iron, calcium, folate. They also provide a good amount of protein and energy. Adequate consumption of beans protects against cancers, type-2 diabetes, and metabolic syndrome. Plus, it reduces the risk of obesity and cardiovascular disease. Furthermore, beans are a good source of fiber and hence help suppress food cravings. So, you can opt for recipes with black beans, red kidney beans, garbanzo beans, pinto beans, lima beans, etc. instead of red meat. Plus, when eliminating red meat from your diet, consider adding lentils and green leafy vegetables in your diet. Simply put, seitan, also called wheat meat or gluten meat, is processed wheat gluten. 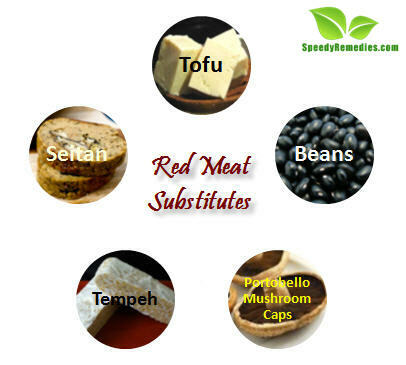 It serves as a nice alternative to red meat because seitan has a chewy texture, and it looks similar to meat. Moreover, seitan is high in protein and low in fat. In fact, it has more plant protein than tofu. You can find it in most Asian grocery and health-food stores as refrigerated blocks, strips or cans. Interestingly, it is believed that seitan was initially created by Buddhist monks to encourage vegetarianism and dissuade meat eating. This is another popular alternative to meat. Portobello mushroom caps have a meaty texture and are particularly used in burgers and sandwiches. Plus, they are packed with a number of vitamins and minerals like vitamin B6, folate, iron, magnesium, calcium, potassium, phosphorus, choline, niacin, thiamin, selenium, and so on. They are low in calories and do not have cholesterol. Moreover, a three-ounce serving of Portobello mushroom caps contains about 2 g of protein. Furthermore, unless you are a vegan, you can include milk, cheese and other dairy products in your diet because they are regarded as complete proteins. Besides, those who are not averse to non-vegetarian foods but want to cut down on red meat can have eggs, white meat, and fish.